After saying that I play less blitz ( which is true ), I can only be pleasantly surprised that I have now breached 1100 on ICC. OK, it might not seem much to some, but I am not a hard-core blitz player, so to do this is an achievement ! Having averaged the low 1000s most of the year ( with a nadir of 860 ! ) personally, I feel very good about this. 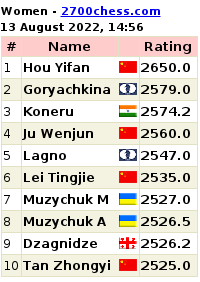 I will try not to be distracted from "real" chess, but will certainly enjoy the (probably brief ) 1100+ rating. 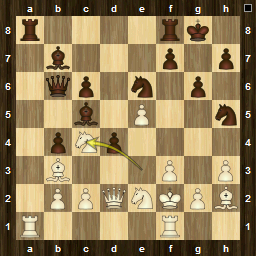 It was also great that it was a Réti gambit game that put me there : I enjoy playing it ! I played a poor game. 1.e4 and a Philidor, but I just didn't seem to choose the right moves and after a mis-calculation regarding a hanging pawn ( that I thought was protected by indirect means ) I went down 2 pawns and never got back into the game. I did fight to the end, but eventually he woke up to using his extra pawns, and I was history ! 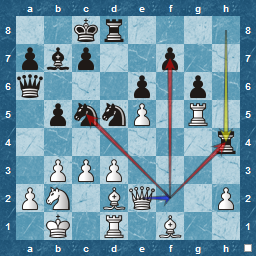 Here I was correct with Nf4, as the c-pawn is indirectly protected. But I didn't calculate far, or accurately enough, as Bb7 is not a good move. The a-Rook isn't really threatened at all ! However, despite this loss giving a drawn match ( 2-2), because of our better forfeit rating we should go through to the next round. I really felt a lack of sharpness and inspiration, possibly due to a lack of any chess effort in the last two weeks, so I will need to invest in some tactics practise before the next round. I am deliberately playing far less blitz than I used to. I play every now and again, and have had far more consistent wins than previously. 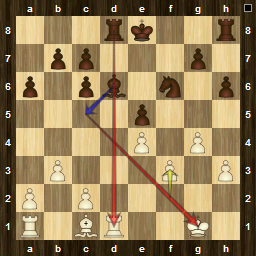 Here's a win in an Open Sicilian, Scheveningen. I haven't played against a Sicilian for a while so forgot my exact theory, but so, it seems, did Black. 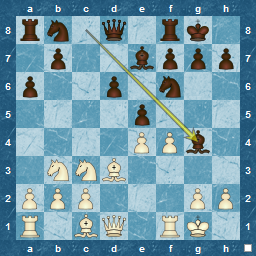 Here he has played Bg4 attacking the Queen, but is it a premature attack ? 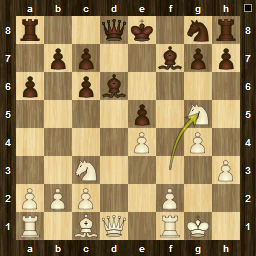 Better moves would be b5, or exf, as Bg4 just gives White an easy response ( not always helpful in blitz :). It gives me an obvious attack... f5 ( to attempt the trap the Bishop ), Qg3, ( opposite the King ) , Bxh6 ( winning a pawn )...especially when helped by h6. More thought would probably not favour Qg3, maybe h3, g4 instead, but in blitz, direct attack is always good as it can provoke mistakes. Much better was to play the King to h8 or h7, as after the en passant capture, the king's protection disappears and Black resigns, having lost the exchange at the minimum. In blitz, meeting the Sicilian head-on with the Open game instead of an anti-Sicilian doesn't always play into Black hands. He needs to know his theory, or else a mis-timed move can be just as bad for him ! The end of the main season sees Magnum Ignotum ( the U1600 Team I play for ) in the playoffs with 4 wins, 2 draws and a loss. A good performance by the team and and also for me ( +4=1-1 ) . The playoff will take some time as it arrives in the Christmas holidays, so may seem to be drawn out. Our opponents contain players I have never met before, with the likelihood that I am paired with a +1700 player ! Looking forward to it. As White I won a Scotch (Four Knights ) and lost a Bird. Maybe there's a message here ? Concentrate on trying to win as White ! The U1800 team ( Chessmasters ) didn't live up to their name, suffered with forfeits and so came bottom of its section, not gaining a single match point ! However, with so many new players, I think we did OK and I hope that we will stay together for a stronger attempt next season. My record was equally bad : played 3, lost 3. However, in two of those games, one was mine for the taking, as I missed a clear win and the other was a well-fought, and enjoyable French Defence that I had good chances in, but missed a key move at the end. I still need to go through both of these and post them. In the U1800s I played against the French Defence as White and as Black a strange opening ( with 1.d4 ) that switched to a Philidor by move 5 with no loss of tempo to either side ! I also lost as White in a Spanish against future Grandmaster OxidisedLizard. I'll be looking for revenge some time ! I wonder if it is worth checking if U1800 opening choices are significantly different from U1600s ? Anyway, my intention is to play in both sections ( U1800 & U1600 ) next season, if at all possible. 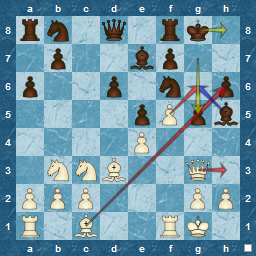 I find both give good opportunities, and playing higher opposition certainly stretches my chess at times. I should do one of two things. Either a) give up playing chess or b) improve my calculation and vision. How did I miss it ?! I'm sure, dear readers, that you can see the obvious move. Is there a chess maxim that you should always play a check ? Enjoyable, none the less, although I'm a little aggrieved that I made my losing move after my opponent started to talk to me and interrupted my concentration. I would have lost on time anyway, but next time I will play in silent mode ! This seems a significant event : 64 standard games on ICC. So, despite the result , I think I should celebrate it ! My opponent was OxidisedLizard, a future Grandmaster in disguise, and against me it showed ! The game was simple. I made a basic mistake, realising as soon as I had played it that I had lost a piece, and probably the game in this sort of company. Until that point, I had been OK, although I had started an attack too early, and had effectively handed the initiative to Black after 11. Ng5. 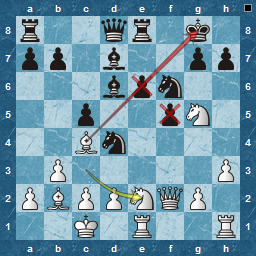 I had overlooked that Bc4 was a fine riposte, avoiding any exchange and forcing White to do something. 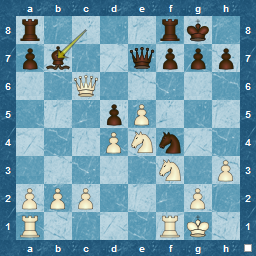 Unfortunately, I didn't do the right things and with a further piece threatened after h6, I miscalculated basic tactics and made my game-losing mistake ! I could have resigned straight away, but played on, keeping the score to "one piece down" until some nice manoeuvring put my king at a distinct disadvantage. Black played simply and well, but missed a chance to deal a death-blow on move 17. Instead of a crushing Bc5+, winning the rook with a discovered attack (or if Be3, the bishop), Black castled and encouraged me to continue for a few moves ! I'm now on a lower board for the U1800s ( we have a new player ) so had a slightly fairer chance in my next TL outing, but overall, an enjoyable game, and with my review of it, I think I will be in better shape next time I play the Spanish. A very enjoyable game in the T9030 format today. My opponent obviously enjoys his slow chess and played at a good pace. 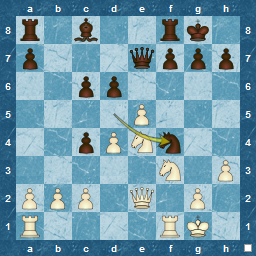 An unexpected French Defence ( to both of us : he was trying something new ) as I was expecting an e4/e5 game, but I produced "The Fascinating Réti Gambit", and we were both out of book by move 3 or 4 ! 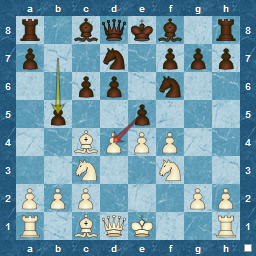 I need to take some time to think and analyse this one, but this was a real gambit for me : a pawn with compensation in the form of a very good attack and long-term pressure against the d6-pawn. This blatant pressure gave me my simple plan, and I stuck to it ( abandoning the initial g4 idea ). He defended, while I attacked, and when I played Ne2 to "remove a defender", it was the key moment of the game ( at least in my eyes). 14. 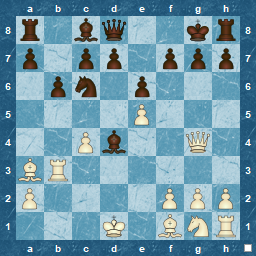 Ne2...How should Black respond ? I think this was better than I believed at the time. I was aiming for a remove-defender play, but with the attack on f5 , the exposure of the b2 bishop, and especially the pin (crucial in the latter part of the game), Black needed to find a good response. What would you play ? The prodigy is now twenty, and shared his perfect weekend with Telegraph readers, a rare outing for chess in a a national newspaper !